The Afterlife of Empire is an award-winning investigation on how decolonization transformed British society in the 1950s and 1960s. Although usually charted through its diplomatic details, the collapse of the British empire was also a deeply personal process that altered everyday life, restructuring routines, individual relationships, and social interactions. The book traces a set of diverse yet interrelated and richly compelling stories: West Indian migrants repatriated for mental illness, young Britons volunteering in the former colonies, overseas students seeking higher education, polygamous husbands and wives facing invalidation of their marriages, West African children raised by white, working-class British families, and Irish deportees suspected of terrorism. Postwar welfare–from mental health to child care–was never simply a British story, but was shaped by global forces, from the experiences and expectations of individual migrants to the emergence of new legal regimes in Africa and Asia. The book thus recasts the genealogy and geography of welfare by charting its unseen dependence on the end of empire. Using a wealth of recently declassified files from the National Archives, oral histories, court cases, press reports, social science writings, and photographs, Jordanna Bailkin illuminates the relationship between the postwar and the postimperial. 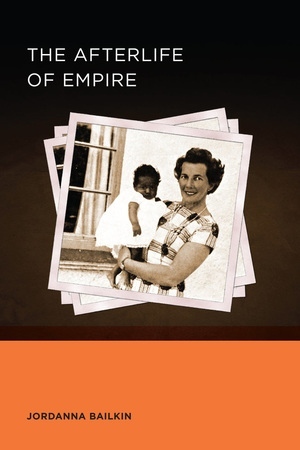 The Afterlife of Empire is the winner of several notable prizes including The Morris D. Forkosch Prize from the American Historical Association, the Stansky Book Prize from the North American Conference on British Studies, and the 2013 Biennial Book Prize from the Pacific Conference on British Studies. Jordanna Bailkin is Giovanni and Amne Costigan Professor of History and Professor of History and Women's Studies at the University of Washington.